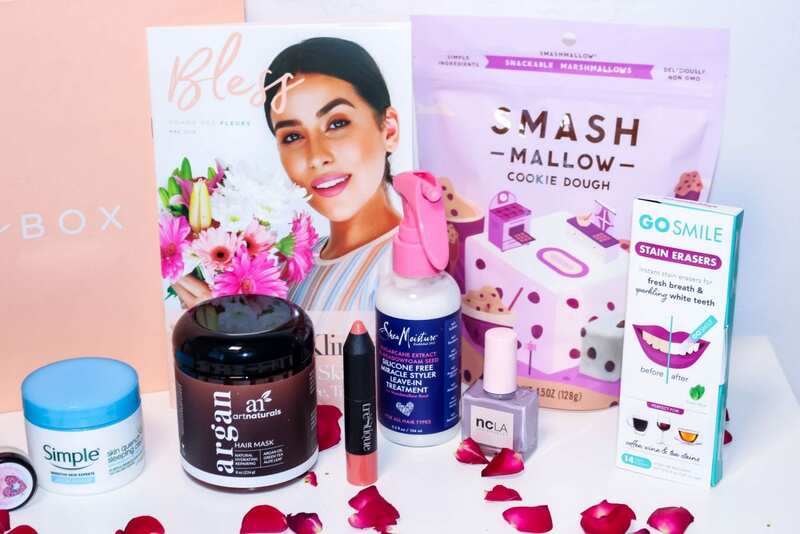 So many monthly subscription boxes are thrown at us these days. It started off with Ipsy and Birchbox (at least for me) and now there's all kinds of boxes. Fabfitfun, Harry's and so much more. I've had the pleasure of trying each of these, and I think that The Bless Box is one of my favorite ones. To me, this is the subscription box worth waiting for each month. So many goodies every in every box. You can check out The Bless Box here. This is not sponsored. I'm breaking out all the goodies in the May Bless Box. This is seriously the most delicious dessert. I love chocolate, and I do enjoy a good marshmallow, so a cookie dough marshmallow is totally up my alley. It tastes like a s'more without the campfire and the graham cracker. This is a the best non-GMO, preservative free, gluten-free dessert. Guilt-free and delicious. When it comes to detoxifying and removing the dirt, oil and pollution from your skin, a good mask is what you need. After using this mask several times the past few months, I can attest to its cleansing power and the fact I can get an amazing glow and a luminous finish. I absolutely despise cleaning my brushes. Seriously. It's something I try to do...never. In all honesty, I know how important it is so this new cleanser is the best. This is a solid makeup brush cleanser that lets me lather my brushes, and if they're very dirty, it definitely takes several good scraps. However it is so easy and quick to make the brushes cleaner. This gorgeous muted heather purple shade is seriously giving me life. Not only is this the perfect versatile color, it is honestly one of the best colors to wear on a day to day basis. These polishes are 100% vegan, cruelty-free and 7-free meaning they're perfect for the little kiddos' toes and fingers. I just finished this popcorn. It's ridiculously delicious. It's got hints of that coconut oil, with this amazing pink Himalayan salt thats incredibly satisfying. I don't know if you know this about me, but popcorn is my favorite snack in the entire world. When it comes down to specific makeup products, blush is one of my all time favorites. There's something so amazing about adding a little flush to the cheeks. Especially when the flush can be a color that compliments the skin tone. This is such a creamy, gorgeous blush. When it comes down to it, we all need a good moisturizer for the night time. This cream helps to reverse that dehydration. Honestly, my skin is literally cracking and peeling (TMI??) because it's so ridiculously dry here in Arizona. This lightweight gel has helped to refresh that peeling to get my skin to a great place. When it comes to a night cream, I like to "overdo" it when it comes to the application. Mainly because I want to ensure there's enough product on my face to make a difference overnight. Who's with me!? This is the perfect product to detangle, moisture and reduce that drying time. Not only does this product do all of these, I have noticed my hair is legitimately shinier, and more nourished, especially in these dry climates here in Arizona. No matter what kind of climate you live in, this product helps keep your hair in place. It can outlast humidity, dry heat (and sweat) and so much more! When it comes to summer time in Arizona, all I can think about is moisturizing my entire face. This includes my lips, and usually applying a pretty color to my lips does not mean moisture. However, with this lipstick, the lips get some serious moisture and also a gorgeous color. Did I mention I love moisturizing products? This skin cream is so incredibly moisturizing, healing and definitely not greasy! This is one of the goodies coming from Japan to be extremely healing, and if you know anything about me, you know I love Korean and Japanese skincare. Japanese skincare is always a good choice. This on-the-go whitening applicator is so important for those moments where you need an extra brightening effect. Not to mention these also prevent new stains from happening, especially if you're anything like me and you love your coffee and red wine! I was just listening to a podcast today (The Skinny Confidential of course) talking all about the importance of vitamin C. This formulation is made with witch hazel, watercress, aloe, and elderflower which helps to bring the relaxation to your skin. One of my favorite traits of this toner is that it helps to reduce my severe hyper pigmentation. What're your favorite product in this box? I can't help enjoying every single one. Whether it's food, skincare or the makeup products. I think skincare is my favorite, but food? I will eat each every snack in this box like it's nobody's business!